This is not a dump cake. No, it is just a peach dump, and my sweetest grandma (hi Nonnie!) gave me the recipe. Or well, it’s so easy that I am not even sure that it should be called a recipe, but I guess it has ingredients and such, so it’s a recipe. I promise though, this is so easy. You can’t mess it up. Probably one of the easiest recipes on this site. First up though, what do you guys think of my pretty new baking dish? I am kind of excited about it. I found this new (to me) site, VIETRI, a while back after seeing some of their stuff in Martha Stewart Living and went a little crazy ordering pieces. I am concerned this is becoming a habit of mine. See, I want to order new dishes/props all time. Like all time. Yes, it’s getting to be a problem. Well not like I need to join a support group kind of problem or anything. Most of the time I just put a bunch of stuff in the cart and never end up pulling the trigger because I am too chicken and scared that I’ll spend all my money. Sometimes though, if I am really in love with something I just close my eyes and hit the order button. Scariest thing ever. Issues over here. I know. I have been working with VIETRI a bit though, so I was super excited to have an excuse to order a few things. I fell in love with the Lasta Gray collection. If you are looking for some pretty serving pieces I would definitely check them out. They have everything. And I promise, I am not being paid to write this. I just really like their stuff and get a lot of emails about where I get the dishes and props that I use in my photos so I thought I’d let you in on this one. Can we talk about this dump now though? I think we need too. I feel weird calling it a dump, but that is exactly what it is, a dump. My Nonnie’s recipe is actually slightly different than the one I am telling you about. 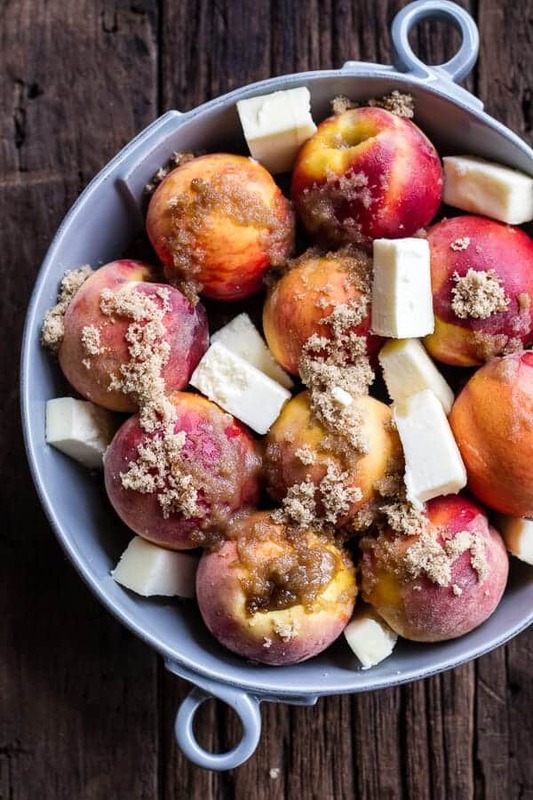 Hers has just three ingredients: peaches, brown sugar and butter. Nothing wrong with that, but I love the idea of bourbon and peaches together so I threw a little (or a lot – Happy Tuesday!) bourbon in. Plus, I think the bourbon really helps to balance out the sweetness. Originally this recipe called for a whole pound of brown sugar, but umm, that just freaked me out. A whole pound is A LOT of sugar and especially paired with something that is already so sweet. I took it down to one cup and thought it was just right. So why are we calling this a dump? Because all you do is dump everything into a baking dish, put it in the oven and walk away for the next hour and half. Well, maybe come back to spoon the sauce over the peaches once or twice, but that’s it. 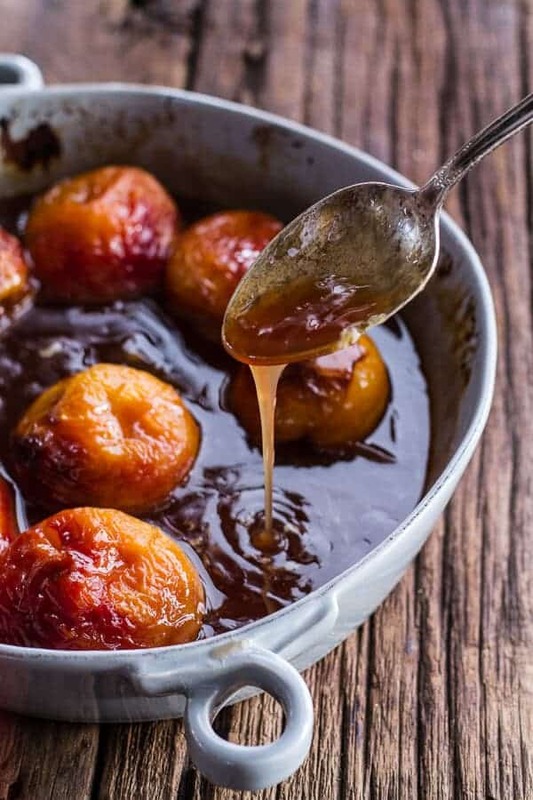 You dirty only one dish, you slice NOTHING and you end up with the sweetest peaches that are soaked in a self forming peach bourbon caramel sauce. Seriously you guys, I am not even really into fruity desserts, but this, this is so good. 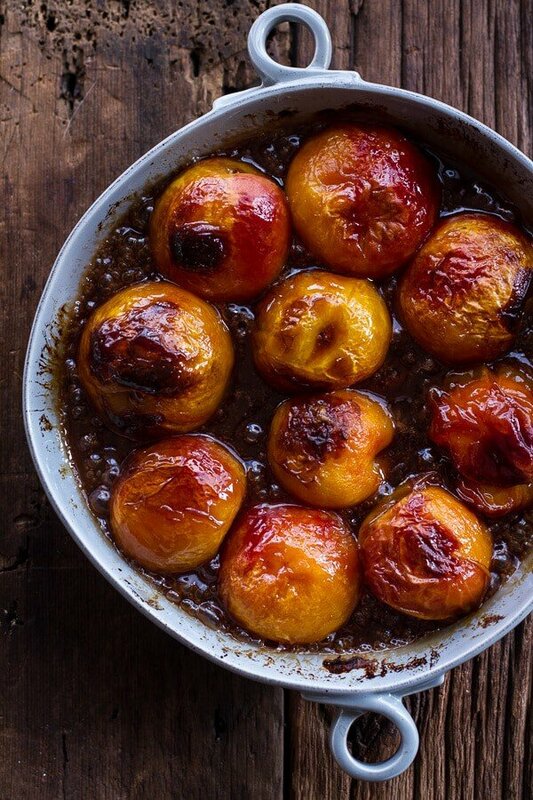 It’s all about the peaches and the sweet sauce that forms as the peaches bake. 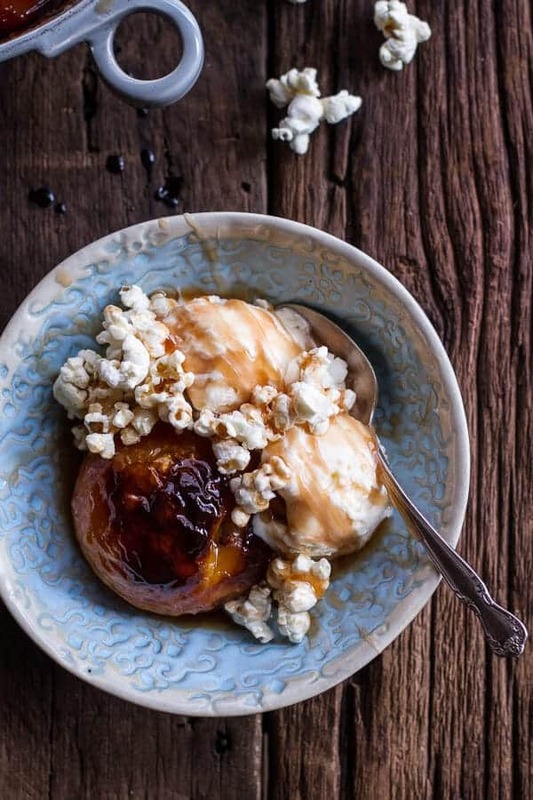 The brown sugar, butter and bourbon create a peach bourbon caramel sauce that is TO DIE FOR. That sauce. Oh my gosh, that sauce. I would bake this just to have the sauce. You can drizzle any leftover sauce over your morning waffles, pancakes or french toast. You could even drizzle it over your ice cream sundae. The options for the leftover sauce are endless. Just do not toss it out. You have to use up every last bit of sauce. It’s liquid gold. 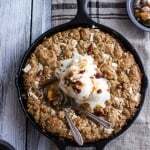 You also have to serve it alongside vanilla bean ice cream. No negations, you have to. Oh and you also can’t skimp on the buttered popcorn. This was my contribution (well and the bourbon) to this recipe and if I do say so myself, it was a dang good one. 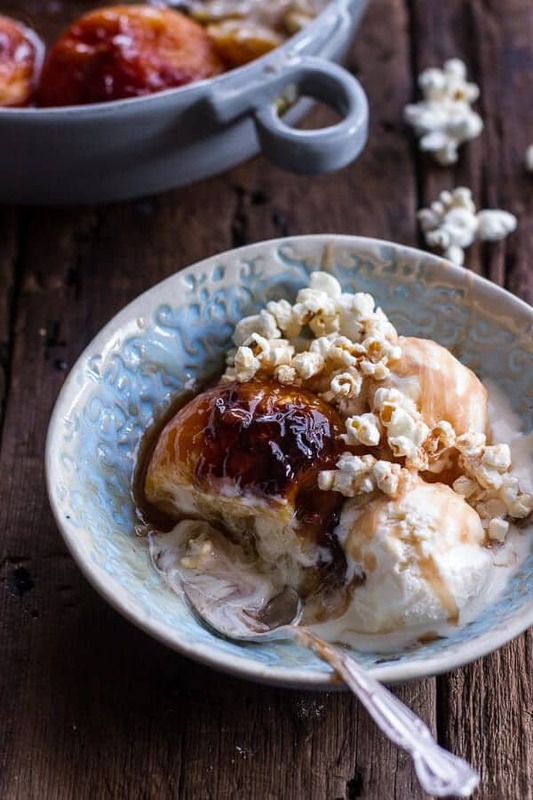 The popcorn just kind of melts into your mouth when it get mixed with a little sauce, a little peach and a little ice cream. 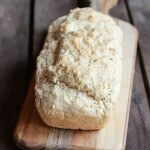 It adds just the right amount of texture without being too crunchy. And come on, it’s popcorn, you can never go wrong with butter and popcorn, especially together. You just can’t. You can also never go wrong with an easy, show stopping dessert like this. Come fall switch the peaches for those pink lady apple. Apples and bourbon? Mmm, Maybe even better than peaches and bourbon. I promise though, this is so easy. You can't mess it up. Probably one of the easiest recipes on this site. vanilla bean ice cream DONT SKIMP, coconut milk ice cream is AWESOME! Place the peaches in a 9x13 inch baking dish or one slightly smaller. Sprinkle the brown sugar over top. Add the butter (you do not even have to cut it up). Pour in the bourbon and vanilla. 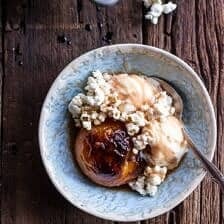 Bake between an hour and an hour and 30 minutes or until the peaches have softened and butter + brown sugar have created a DELICIOUS peach caramel sauce. I let mine bake the full 1 hour and 30 minutes. Just before removing the peach dump from the oven, toss the warm popcorn with the melted butter and salt. 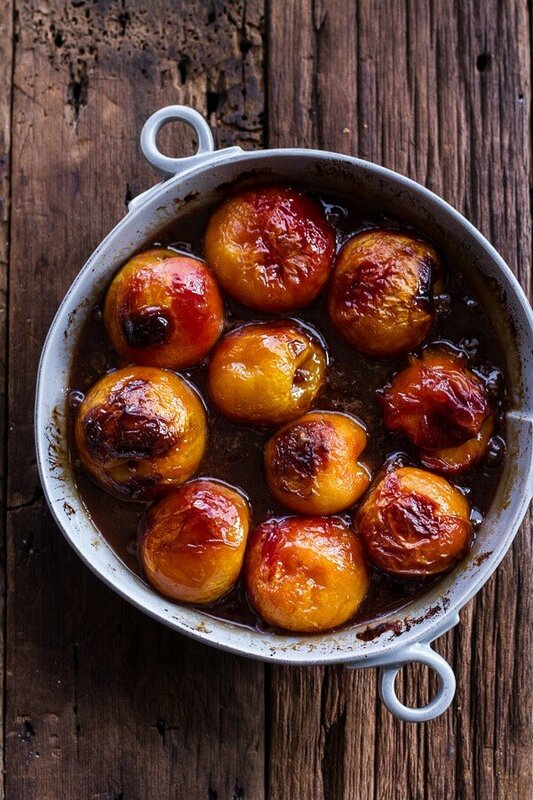 Remove the peach dump from the oven and divide the peaches among dessert bowls. Add a generous amount of the bubbling caramel sauce over the peaches. Place a scoop of ice cream in each bowl. Add a handful of popcorn and drizzle with more sauce from the dump. Eat while hot. Just make sure to remove the pit from the peach once it pops out. Just melts in your mouth. So good. This looks fantastic, and I will be serving it up to my family soon. In other news, yes I feel we do need to form a support group for people who compulsively buy food styling props. I came back from the home-wear outlet store the other day with a massive slab of creamy marble and a couple of presentation bowls just because it happened to be around the corner from my meeting and I just thought I’d take a look! Haha! I love this. A support group for prop buyers. Yes! I Love this! 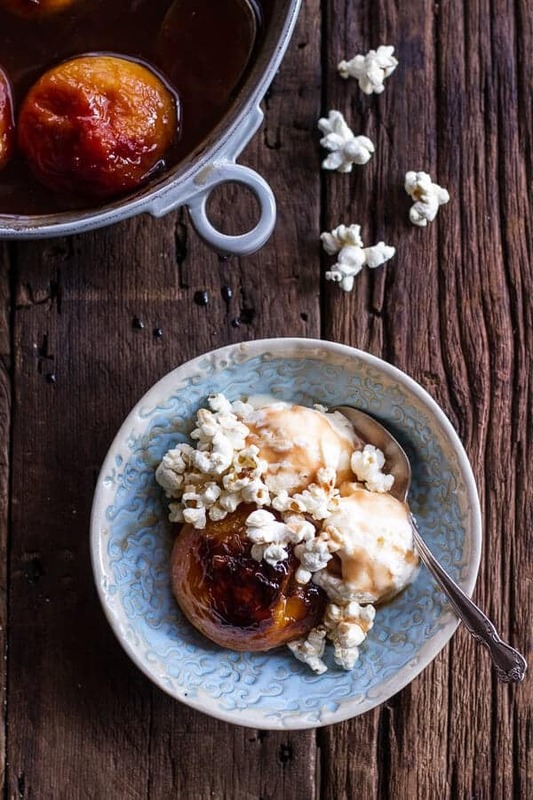 Especially the slight saltyness of the popcorn with the delicious bourbon peaches! This is one of those recipes that is so weird is HAS to be good…plus all the ingredients on their own are awesome…so why not together! This looks amazing! I also LOVE VIETRI, my favorite line is the Incanto White but I also adore the Lastra Gray. I may just have to place an order soon! I was so close to getting some of the Incanto white, next time! I want to be your neighbor so I can smell all the amazing things you make! This looks wonderful! This looks incredible – love the peach/bourbon combo! THank you, Kathy! Peaches and bourbon is a classic. I love it! 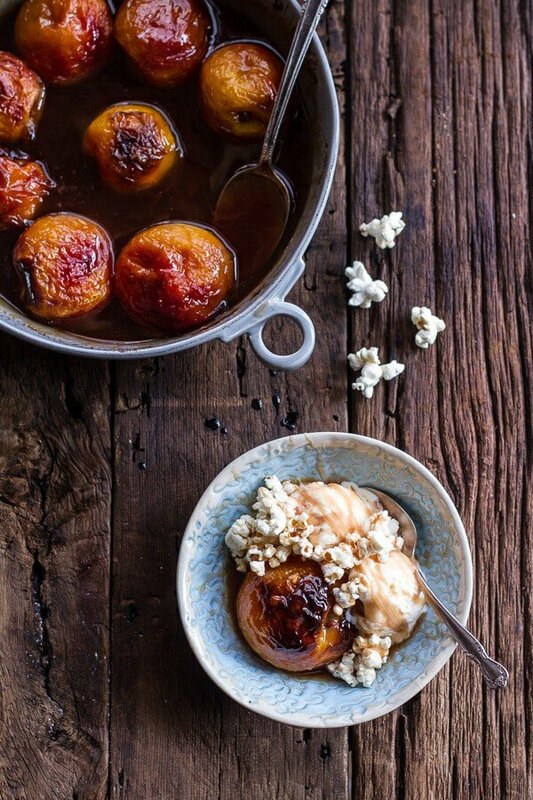 I love peaches with bourbon – it really brings out the flavors of both! This looks amazing! I am also in-love with the baking pan, absolutely adorable! 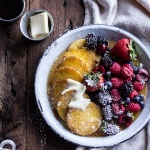 i am new to this whole dump business, but i’ve been hearing about dump desserts more and more! i saw an entire dump cake book the other day and laughed in disbelief… but your explanation makes total sense, ESPECIALLY if there is bourbon involved. because when there is bourbon involved, there is a party involved, and when there is a party involved, hell no you do not want to do more dishes than you have to. Whoa, a dump cake book you say? Now come on, not sure if that is going to far or just pretty awesome… I actually didn’t know dump desserts are a thing. I will have to look um up! Also, YES to not doing more dishes than you have to. I freaking hate the dishes. I think I’m in love. 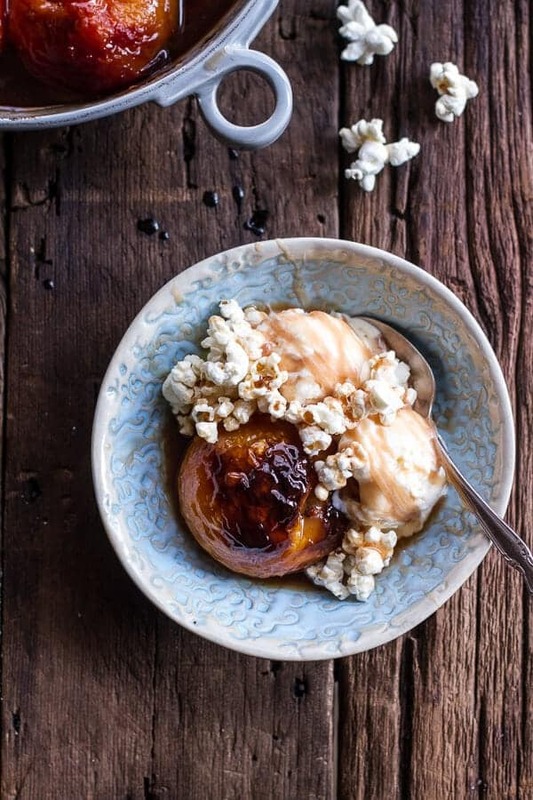 Bourbon, popcorn, peaches, ice cream, butter (!!! )… This recipe is like some weird, subconscious, food fantasy come true! I am going peach picking this week and this weekend I’ll be stuffing my face with this! Peach picking?!? So jealous. Have fun and thank you! Bourbon AND peaches!!! Yeah boyeeeeee! 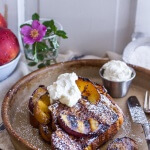 It’s peach season where I live and I have been looking for an easy but delicious dessert for some very special company this weekend and THIS is IT! My friend is lactose intolerant so I will definitely use coconut milk ice cream! This is so your dessert. It is perfect for entertaining! Thanks Terri and I hope you all love it! This looks so good and I love how easy it is. And yes, totally need a support group for buying props. I want to buy ALL THE THINGS!! Okay you’re actually killing me now. This looks perfect. (Literally perfect.) 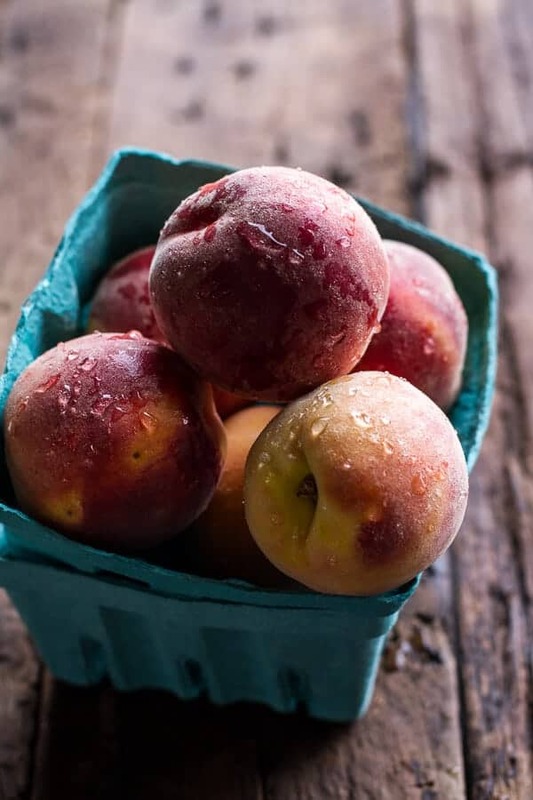 I’ve been looking for the proper recipe to utilize Louisiana peaches in season right now and today I was actually planning on baking with popcorn. Go us! I’m so with you on the props thing. The other day I spent 4 hours shopping for props out of pure boredom. My bank account isn’t very happy with me but my pictures will be beautiful sooooo……. Yay! we are so on the same page! I WANT THIS IN MY FACE! Absolutely love this and the bourbon is a must! wow, my husband is going to LOVE this – he is a big fan of bourbon and desserts. 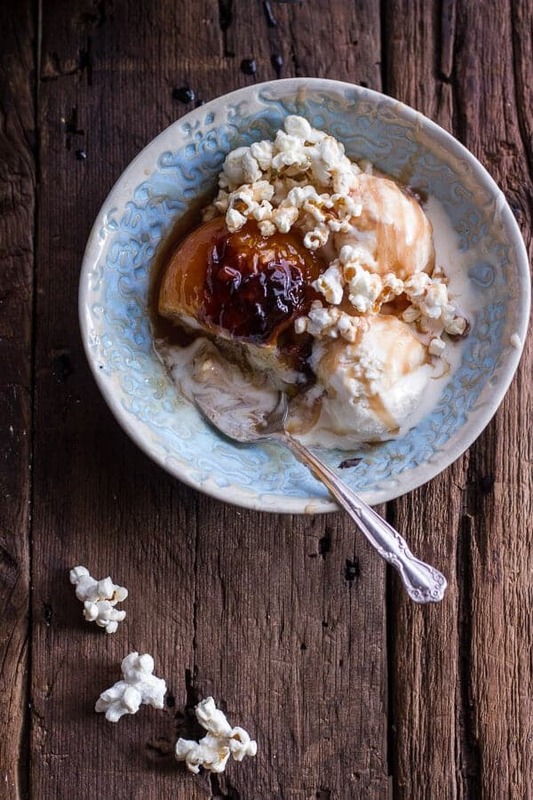 i am obsessed with popcorn, so this might be the perfect sweet treat for us! Ya!! Hope you both love it. Thank you! The popcorn is just inspired. What a lovely and delicious peach dump! I want a big bowl in front of me now! I’m imagining myself doing a swan dive right into that peachy bourbon caramel sauce…holy moly it looks so freakin’ good! 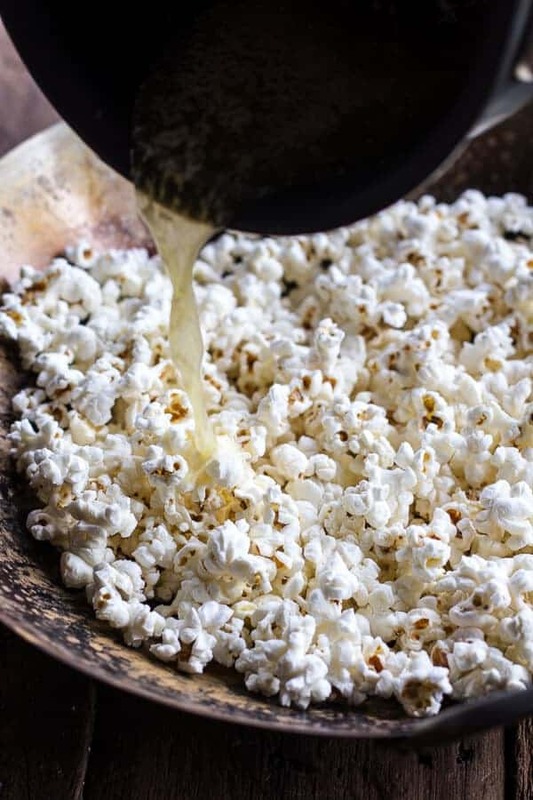 I love the addition of popcorn, it’s kind of like the garlic bread to a pasta dinner, you know the part to help mop up all the leftover sauce – perfection! Umm, whoa! That sounds just amazing. The apple cider vinegar is getting me so excited for fall!! How would you recommend storing the leftover syrup? Fridge or room temp? Also my syrup was much more runny and thin than yours appears to be in the pic. I followed recipe to a T, any advice? PS this is one of the best things I’ve ever tasted, thanks so much! Could you do this in a slow cooker or does it have to be done in the oven?